There's Magic in the Fur! I'm so happy you had a very nice Christmas! Do I see seven? Your big B and W piggy has the most fantastic bum. Love them all. So much! Happy (belated) Christmas and new year! Looks like you had a smashing time! We did, thanks, poppycorn! Happy New Year to you Too! I feel so guilty for not taking photos and posting. Life has been hectic, different jobs to do. Also, 6 piggies seem so 'contained' somehow, they don't want our fuss!!! Love the piggy pictures. Won't let my girls see the food they may get jealous. Wonder what Betty would look like bathed and dried by a drier? Would she just be a ball of fluff. I am going to have to start swimming to piggy nap some piggies. Happy Belated Christmas and New Year from us and the girls. Shucks! I just discovered this thread - I missed the Christmas festivities! And while I too want to swoon over your new little fuzz-ball, I am partial to himis - and your two are just gorgeous!! I am SO sorry I am not keeping up with my piggy chronicles. All I can say is life seems rather hectic here at present! Apart from anything 6 piggies are certainly keeping us busier than I ever imagined! One thing I am excited about is the Little Free Library we are setting up in the village. It has been a few weeks in the planning and the Big day has arrived, Ian is erecting it tomorrow!If anyone here hosts one I would love to hear about it! It's grass-time now and as there are 12 eyes staring up at me I'd better get the grass basket! Big AWWWWWWW! What a sweet couple! And I hear you on the 6 pigs = work. I have 5 and both the husband & I are amazed at the work they so willingly provide me. Betty isn't big, thats fluff! ;o) She is growing though, that's for sure. Oh, that is a lovely Valentine photo! I do imagine those 6 guinea pigs are keeping you on your toes! Happy Valentine's Day, MildredM! And of course, Ian and the herd! Love the stink eye. Lovely piggies. Happy Valentine's day to all for yesterday. How adorable! We don't have a little free library, but they started in Wisconsin, where I live, and they are literally all over the place. I think they are a lovely idea. I've borrowed a few books from one. Betty doesn't look like a baby anymore! Free library - sounds like lots of fun. they grow up so fast dont they? 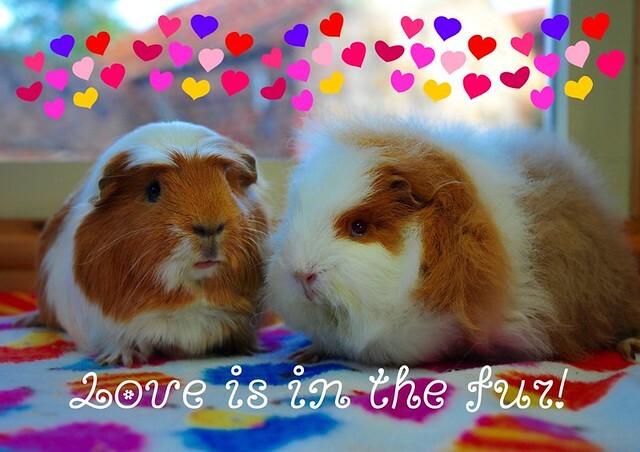 ↳ Fun for Guinea Pigs! Please Support Guinea Lynx in 2019! Are you a Guinea Lynx Fan? Tell the world on Facebook!